A minor cut almost took 11-year-old Jonah’s life. Now, he and his brothers are giving back to CHLA—for a ‘Dreamnight’ at the Los Angeles Zoo. 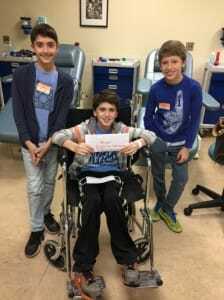 Jonah (center) along with his twin brothers present a check to the Blood Donor Center. Meet the Osterman brothers: Jonah, 11, and twins Asher and Dylan, 9. Normally, the boys keep their family busy with a whirlwind of sports and school activities. Lately, though, they have a new mission: raising money for Children’s Hospital Los Angeles. In fact, the boys and their parents, Sarah and David Osterman, are among the top fundraisers for Dreamnight, a free, private night at the Los Angeles Zoo for CHLA patients and families. The June 5 event will give families a chance to meet animals up close and personal, and funds will benefit both organizations. The Ostermans, who raised $3,200 for Dreamnight, have a simple—and personal—reason for supporting CHLA. Jonah’s illness started with the most innocent of childhood afflictions: a minor cut on his knee. An active fifth grader who plays multiple sports, including soccer and football, he fell during PE class one day at the end of November. But a week later, Jonah began complaining of hip pain. Soon after, he spiked a fever that quickly climbed to 105, and the Ostermans found themselves rushing to Children’s Hospital Los Angeles. Jonah was suffering from methicillin-susceptible Staphylococcus aureus—more commonly known as a staph infection. Originating from that small cut, the bacteria infiltrated his blood, hip and pelvic bones and lungs. It was a life-threatening infection. After 25 days at CHLA, which included hip surgery and two blood transfusions, Jonah went home Dec. 29, 2014. Although it will likely take him a year to fully recover, he’s back at school, feeling better, and is excited to finally be walking without crutches. Grateful for the expert and compassionate care Jonah received at CHLA, the Ostermans began looking for ways to say thank you. Earlier this year, Jonah and his brothers joined the Junior Ambassadors at CHLA and raised $3,000 from relatives and friends for the Blood Donor Center. Their next fundraising project was Dreamnight. A global event founded in 1996 at the Rotterdam Zoo in the Netherlands, Dreamnight takes place the first Friday in June at more than 250 zoos, aquariums and museums around the world. This is the first year CHLA and the Los Angeles Zoo are participating. Munchkin, a Van Nuys-based children’s products company, is the presenting sponsorfor the event. The Dreamnight Committee is made up of leadership from both organizations and is co-chaired by Beth Price, a Trustee at both CHLA and the Greater Los Angeles Zoo Association, and Kim Shepherd, a CHLA Trustee. The Ostermans, meanwhile, are looking forward to more fundraising and hope to organize a blood drive this summer. To learn more about Dreamnight or to make a donation, go to CHLA.org/Dreamnight. Bad Cold or Enterovirus D68? Flu Season Is Here, But Is It Too Late For The Vaccine?